Recommended tank size: 45 x 30cm (18 x 12") or larger. Tank setup: Planted tank with subdued lighting and gentle circulation. Compatibility: Best kept in a species tank, males can be quarrelsome. 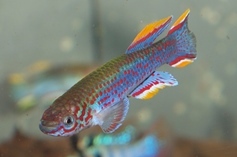 Sexing: Males are larger and more colourful with extended finnage. Breeding: Eggs will be scattered over fine leaved plants, hatching takes about two to three weeks. Fry will be free-swimming almost immediately and will need tiny live foods initially, such as microworms and baby brine shrimp (Artemia nauplii). Comments: Soft, acidic 'blackwater' conditions are ideal for this species. 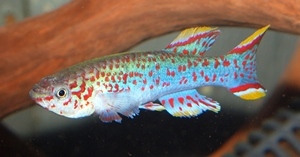 The use of peat in the filter or the addition of commercial blackwater extracts, bogwood and/or leaves (such as Catappa, oak or beach) to the tank is recommended.